Week 10 of the NFL season opens with the Cincinnati Bengals hosting the Cleveland Browns on “Thursday Night Football.” The contest is the first of many exciting games on the NFL Confidence Pool Week 10 sheet. The Bengals and the Browns have been battling for Ohio supremacy dating back to 1970. Entering the 2014 NFL season, the Bengals hold a slim 43-38 edge in the all-time series. The Bengals have won five of the last seven meetings overall. 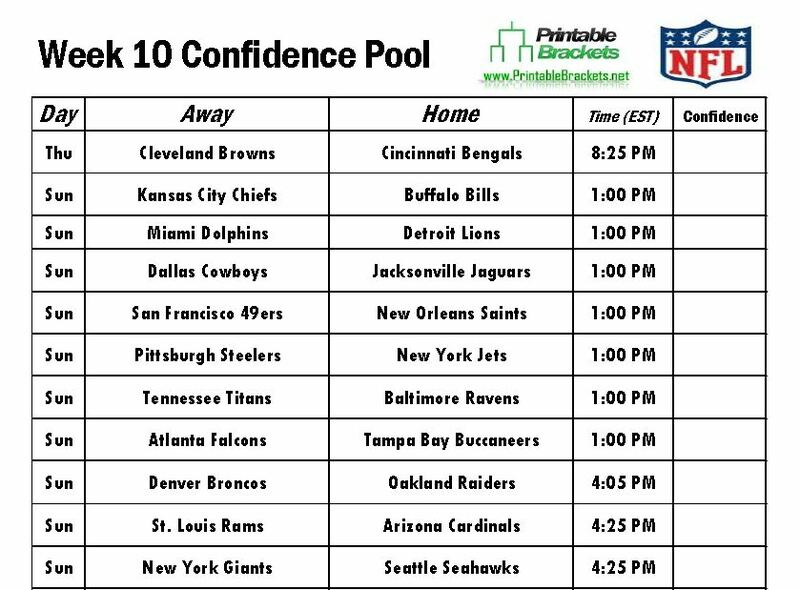 Meantime, there are some notable early Sunday games on the NFL Confidence Pool Week 10 sheet. Drew Brees and the New Orleans Saints will host Colin Kaepernick and the San Francisco 49ers. In other action, the Pittsburgh Steelers will square off with the New York Jets, the Atlanta Falcons will face the Tampa Bay Buccaneers, while the Detroit Lions will host the Miami Dolphins. In late Sunday action on the NFL Confidence Pool Week 10 sheet, the defending Super Bowl champion Seattle Seahawks will host Eli Manning and the New York Giants. The Denver Broncos will be on the road to take on the rival Oakland Raiders. Four teams will have the weekend off in Week 10: The New England Patriots, New York Jets, Cleveland Browns and Kansas City Chiefs.